[Ed's Note: Glen died in a tragic airplane accident in Canada in August, 2008]. This is used with permission of his beloved wife, Lynne. It has been ‘lightly’ edited from his original manuscript given to Ed Jesteadt in 2006, and some pictures added. The village of Macfarlan [below] is roughly halfway along the road to Hogsback. The Macfarlan Presbyterian church [top center below], situated on the site of a mission station established in 1827, supports 13 outstations in villages straddling the Tyume Valley on either side of the road to Hogsback. The first missionary was the Rev. Alexander McDiarmid, who along with his wife is buried at Macfarlan. A notable convert from the region was Rev. Elijah Makiwame, who headed Macfarlan mission from 1876. His daughter was Cecilia Makiwane, the first Xhosa to become a registered nurse, and after whom the hospital in Alice is named. is situated in the Eastern Cape Province [ECP]. The major city in the ECP is East London on the Indian Ocean. Inland [west] from EL about 120 km is the town of Alice, where Fort Hare University is located. 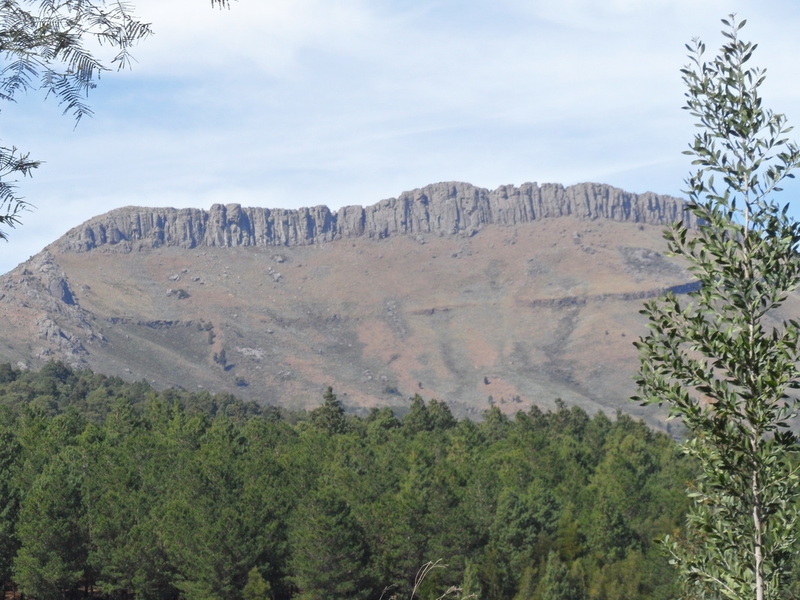 Just a few kilometers before reaching Alice is the turnoff for the Hogsback road that goes up the heart of the Tyume Valley to the village of Hogsback atop the Amatola Mountains - shown here. 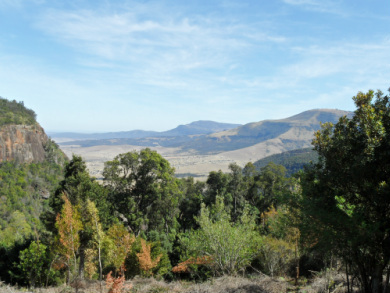 From Hogsback, you can look south and see the Tyume Valley. Their ancestors were settled in these villages after the war of 1850 by the colonial authorities. The starvation and hardship caused by the cattle-killing tragedy of 1855 finally broke the power of the Xhosa chiefs and the Xhosa nation as a cohesive force. There was little resistance to setting up these villages under the regional authority of a magistrate, to whom the chiefs were responsible. Due to a lack of employment opportunities in the region, residents of these villages are poor in the material sense, but rich in their historical heritage and natural beauty in the rolling hills below the Amatola range. The Tyume Valley of today reflects the stability of people living on land that has been in their individual families for ~ 150 years. Neatly fenced plots in each village emphasise the orderliness of the valley. Cattle, horses, sheep, pigs, goats, donkeys and poultry graze among the houses and on common land. Small church preaching stations, mostly built of wattle and daub, stand among the neat houses in every village. The Tyume River was for 100 years the disputed boundary between the Cape Colony and Xhosaland. [The river is just over the hill from the church shown at left]. A great deal of military activity took place here over the years, and the region was dotted with Colonial forts, many of which have now given their names to towns and villages. Fort Hare and Fort Beaufort, located to the west of the river and valley, are local examples. “Before this house we had a beautiful field of grass in the middle of an amphitheatre of high mountains.....The ascent to the mountains was covered by a thick wood......some of the trees were above 100 feet high. Above......towards the top of the mountain were meadows of a vast extent, and of a beautiful verdure, and the top itself was covered with inaccessible woods." The following historical background, and the poem that is interspersed, were both written by Glen Paterson. It will give you a good sense of how the people of the Tyume Valley came to be who they are. At the dawning of the Tyume Valley. The San or Bushman, as he is now called, was the first human inhabitant of this valley, possibly 20,000 years ago. As a hunter-gatherer, he shared the land with the vast herds that grazed there. Elephants, antelope, springbok and many other buck, giraffe, ostriche and buffalo were among his constant companions, as well as the prowling lions. He would also have been familiar with other species, long extinct. A fossilised skeleton of the famous “Blinkwater Monster” was found in the nearby Kat Valley by the road engineer and explorer, Andrew Geddes Bain in the mid 1800’s.The Tyume (Chumie) is the major river that meanders through this lush valley that bears its name, below the Amatola Mountains. On driving through the valley towards Hogsback, one is struck by the many waterfalls lacing the rocky cliffs and dense vegetation. Early literature describing this area indicates that the only way through the thick forests was by means of elephant tracks. From images left behind in their rock paintings, we can imagine the idyllic life led by the San during this pre-historic period. As they roamed from the Amatolas to the sea in small family groups, the men observing, stalking and interacting with the game and only hunting for food, and the women gathering roots, berries and herbs. Bold exploits were described and re-enacted in song, dance and mime after a successful hunt, while the artistically gifted among them captured the moment and moods with their red and ochre pigments on sheltered rock-faces and cave walls. These were joyous occasions celebrated by all. Personal possession was unknown among the San, resulting in a common well-being and absence of jealousy or violence towards one another. In the grassy Tyume Valley. The Khoikhoi, distant descendants of the San and tribes moving south from central Africa, appeared about two thousand years ago. They were a pastoral people, first seen by Bartolomeu Diaz in 1481 as he sailed along the East Coast. He reports them driving their cattle away from the coast in terror of his ships and disappearing from view. Their milk and meat diet helped the Khoikhoi grow taller and stronger than the San, although they retained their yellowish-brown complexion. The grazing that they required for their cattle and sheep brought them into conflict with the San, as the natural game of the valley drifted away. For the patchy Tyume Valley. Some historians believe that the name Xhosa was given to them by the Khoikhoi, as “Kosa” means ‘angry men.’ In the 1500’s the Khoikhoi was the dominant race from the Cape to the Kei River, but from this time the white man from the West and the black man from the East were drawn towards the lush grasslands of the Eastern Cape. Initially the Xhosa and Dutch, because of their sparse numbers, were able to live in relative peace with the Khoikhoi in the vast grasslands. However, as all three groups kept cattle and their herds grew, conflict was unavoidable. But the cows of the Tyume Valley. As the San had no sense of possession, he had no compunction in helping himself to the cattle introduced into the valley, as a replacement of the game on which he lived. Thus to each of the groups he became an enemy that should be hunted down. In return the Bushman, as he was now called, became a vicious and feared predator, his poisoned arrows and hunting ability widely feared. In the dusty Tyume Valley. As the herds grew and the valley experienced the frequent droughts, herders roamed further seeking grass. Cattle wandered away or were stolen and then reprisal raids took place, setting the scene for conflict over the next two centuries. Driving them from the Tyume Valley. By the mid-1700’s, more Dutch Boers moved towards the Eastern frontiers to escape the restrictions of the Cape government, whether Dutch or English. Some English pioneers were also in the area which was also home to wandering groups of Khoikhoi and Xhosa, following their cattle to where the grass was greenest. Two common denominators between all the groups was their love of their cattle and their hate of the Bushman. The Bushman was seen as little more than animals, and as they were no match for the firearms of the Dutch and English, they withdrew to the relative safety of the kloofs and kranzes and impenetrable bush of the mountains. Latter rock paintings left behind show ships, wagons and firearms, as opposed to the peaceful scenes of the past centuries. The last known bushman painter was shot in about 1850. To the erupting Tyume Valley. Smallpox depleted the Khoikhoi nation greatly in 1750, and pressure from the encroaching Boers drove them from their lush grazing lands of the valley. Cattle were taken in raids by Boer commandos and Xhosa bands, as well as Bushmen hunters. By 1780 the Khoikhoi was broken as a nation, and with their cattle wealth gone, many were forced to go into service on Boer farms as virtual slaves. Others joined the English military forces, where they became invaluable in maintaining law and order over the next century, due to their horsemanship and marksmanship. Numbers also joined Xhosa clans and were absorbed into the tribes, where they were also greatly valued as warriors. Forces of the Cape government now found themselves being drawn into trying to cool the passions of the various competing groups. In 1829 the Kat River Settlement was created, and limited land made available to Khoikhoi, mainly to develop a barrier between White farmers and the Xhosa. In the godless Tyume Valley. In 1799, Van der Kemp, an ex-soldier and medical doctor from Holland, under the auspicious of the London Missionary Society, met chief Ngqika (Gaika) in the Tyume Valley. Although he arrived during a war, he was eventually permitted to set up a mission station under the protection of the chief, and in 1800 opened a school and baptised a few converts in the Keiskama River. However, by the end of that year during the Khoikhoi rebellion, he left the Tyume Valley to move closer to the coast, where he founded a mission station Bethalsdorp, and worked among the Khoikhoi. He created a fair amount of scandal in colonial circles by taking a Khoikhoi wife. It was not until 1820 that Rev. John Brownlee from the Glasgow Missionary Society settled at Tyume, to be followed a year later by W. R. Thompson and John Bennie. Missionaries during this period and for years to come were mistrusted by all parties, being accused of being spies, revolutionaries, etc. However, the Tyume station continued to develop, with the first Baptism and communion services taking place in 1823. The first printing press also arrived towards the end of the year, the forerunner of the Lovedale Press. In the gloomy Tyume Valley. From 1775, with raids by renegade Boers against Xhosa villages with the aim of increasing their herds and territory, to 1877 with a full scale colonial invasion of the Transkei, the pattern of violence and revenge continued. At regular intervals, skirmishes erupted into wars, some brief and others drawn-out. There was always provocation and justification of some sort, but often this was orchestrated by the colonial authorities to achieve a strategic objective. Major causes for the volatile situation were that colonial government leaders were always military appointments, with administrators of the same mind. Expansionist policies of Boers and English moving East into land that they considered unutilised, and the westward moving Xhosa, grazing their cattle on this same land that they considered theirs, provided continual fuel for the flames of war. Ignorance of one another’s customs and traditions was another continual problem, which was aggravated by the deliberate colonial policy of discouraging trade and travel between the opposing groups. Fear of the unknown enemy caused much of the problem, and the people who understood most the moods and frustrations of the Xhosa, the missionaries, seldom were consulted. In the desolate Tyume Valley. With the abolition of slavery in 1834, and the increased presence of colonial government in the region due to the settlement of British families in 1820, most of the Boers decided to join the movement into the hinterland, later called the Great Trek. The war that broke the back of the Xhosa clans as a fighting force started on Christmas day in 1850 and dragged on for 3 years. The Tyume mission station was abandoned during this period. In the years leading up to this the Xhosa tribes had been resettled in different areas, and the power of the chiefs severely restricted with the appointment of magistrates. Governor Harry Smith had not realised the simmering frustrations and tensions within the tribes. A so-called “mere demonstration” by a strong military force through Xhosa territory was the flashpoint that caused the country to explode, as most of the chiefs brought their warriors together to take up arms in one last attempt to drive out the hated English. The tribes were already in a weakened state due to the severe drought racking the region at that time - crops having failed, and cattle dying. After initial successes, the Xhosa were finally brought to their knees by the colonial forces, but overtures for peace were ignored as the authorities took every opportunity to force complete submission. Chiefs were arrested and sent to Robben Island, crops destroyed, and cattle confiscated as fines. The object of destroying the Xhosa self-sufficiency, and forcing him to seek work on white farms to survive, was largely successful. The mass killing of their own cattle in 1855, after a young girl, Nongqawuse, prophesied that their ancestors would arise as new people with new cattle and drive the English into the sea. This finally broke the nation as tens of thousands died of starvation. One estimate suggests that 400,000 head of cattle were slaughtered and 40,000 Xhosa died of starvation over a 13-month period. In the hope-filled Tyume Valley. The migrant labour system was born during the period following the cattle-killing. Men who were previously self-sufficient were forced to seek work on white farms in their desperation, providing the cheap labour long sought. Within two decades, this practice had grown greatly to become the norm with the discovery of diamonds at Kimberley and then gold on the Witwatersrand. People were settled in villages, under the authority of a magistrate, with each approved family head given four acres to farm. By this stage some men were starting to cultivate the soil, which had previously been women’s work. The younger men, who were generally idle, formed the pool from which the migrant labour was drawn. Through this system a small measure of prosperity returned to the valley, but family life was to suffer as a result of migrant labour, with men being away from home for extended periods. However, with money earned on the mines, many young men returned home wealthy enough to buy a few head of cattle which would be used for lobola when taking a wife. While very few people were able to accumulate wealth under restrictive colonial rule, a hunger for education developed. Mission schools grew and expanded into institutions of higher education, one of which was Lovedale. Fort Hare University in Alice, attended by many of Africa’s leaders, including Nelson Mandela, was an off-shoot of Lovedale College. From this early exposure to education the Xhosa developed a political consciousness, which enabled them to take leadership roles in the “struggle”. In the reborn Tyume Valley. It was only after the tragedy of the cattle-killing that Christianity made real inroads into the Xhosa traditional beliefs. Missionaries had experienced more success with the Khoikhoi, many of whom had accepted the Word in the early 1800’s. Two of the main teachings of those early missionaries were the Word of God and the value of hard work. Agricultural training and several other trades were taught, which proved valuable to men in coping with their new environment. The Christian teaching of a better life to come no doubt helped develop the patience of the Xhosa nation in working towards their freedom. The younger generation had difficulty in accepting this subservient attitude of their parents, and took direct action in wrestling power from the apartheid regime. In the relatively smooth and peaceful taking over of government, the lessons and stability learned from the missionaries by those earlier generations can be thanked. Reviving the life of the Tyume Valley. Far from the anger a white South African might expect, on visiting the impoverished Tyume Valley he is welcomed into the humble homes and greeted with love and joy. The people exude the Christian message of forgiveness and hope in the future. The tribulations of the past, experienced by the older generation, are discussed in a matter-of-fact manner. They are more concerned with the immediate present and short-term future. Although the shadow of AIDS hangs over it, a sense of peace prevails in the valley. The legacy of the bloodshed of a hundred years and more has dissipated on the wind of the Spirit, fed by the worship and prayers of the faithful brothers and sisters in Christ. Some come from across the sea, others from neighbouring areas, and are now forging friendships and encouraging His people, both in spiritual and material ways. In return they are being blessed by the gracious people who have borne a grievous load with fortitude, faith and now friendship. In the blessed Tyume Valley. The Macfarlan Presbyterian church, situated on the site of a mission station dating back to 1827, has preaching stations in 13 surrounding villages in the Tyume valley. Elders lead services in these out-stations, many of them still of the original wattle and daub construction. Several times a year the wide spread congregation meets together for joint services or fund raising events. On these occasions, some of the members of this elderly congregation may walk for well over an hour, to answer the summons of the church bell. To return to the MATE website, click here. To return to the top of this page, click here. I want to thank Rev. Luzuko Qina of Macfarlan Presbyterian Church and members of his congregation for introducing us to life in the Tyume Valley. From the initial meeting with them, and subsequent tour, my interest was aroused, and I sought relevant historical reading matter. Glen died in a tragic airplane accident in Canada in August, 2008. The above is used with permission of his beloved wife, Lynne. It has been ‘lightly’ edited from his original manuscript given to Ed Jesteadt in 2006.